Home / Meade Series 4000 Eyepiece & Filter Kit - 1.25"
Meade Series 4000 Eyepiece & Filter Kit - 1.25"
All of your favorite 1.25" Meade telescope accessories are available in one place with the Meade Series 4000 1.25" Eyepiece and Filter Set. This all-inclusive kit makes accessorizing a breeze. This package includes five 1.25" Series 4000 eyepieces: 6mm, 9mm, 13mm, 18mm and 32mm. All eyepieces in this feature a 52 degree apparent field of view with 4-element, premium glass and fully coated optics for excellent contrast and light transmission. Each eyepiece also contains a comfortable soft rubber eye guard. This kit also includes a Meade 2x Barlow that doubles the magnification of any eyepiece in this set as well as all other 1.25" eyepieces. In addition, this Meade Series 4000 1.25" Accessory Kit also contains six color filters: Dark/ Light Yellow, Dark/ Light Blue, Light Red and Green. A Series 4000 ND96 Moon Filter that decreases glare and increases the transparency of your lunar observations is an added bonus. All components of this kit can be arranged in the included black carrying case for convenient transport. With this accessory kit, not only will you be observing instantly, you'll also get tremendous value over buying each item separately. 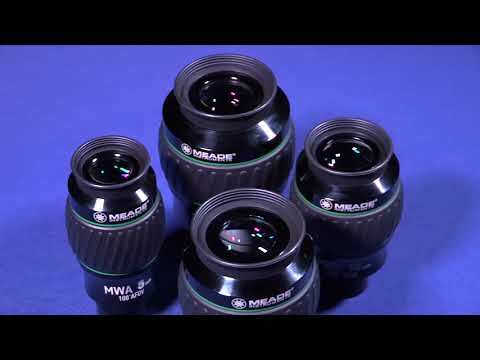 Meade 6mm Series 4000 Eyepiece - 1.25"
Meade 9mm Series 4000 Eyepiece - 1.25"
Meade 13mm Series 4000 Eyepiece - 1.25"
Meade 18mm Series 4000 Eyepiece - 1.25"
Meade 32mm Series 4000 Eyepiece - 1.25"